With the spring/summer season almost within reach, it’s an ideal time to start thinking about replacing those old windows and doors. As well as improving the general exterior and interior of your home, replacing windows and doors can do wonders for your home. From holding in the heat to reducing damp and condensation, it’s an investment which will add value to your home. While timeless and classic designs for windows and doors truly never go out of style, you can modernise your home by showing a bit of personal style too. Every year we see new design trends across fixtures and fittings, and for spring/summer 2019, there are some new ones on the scene. If new windows or doors are on your home’s to-do list for 2019, you might want to cast your eyes over a few of these trends before you start your shop. Remember that your home is your little adobe, and should reflect your personality. 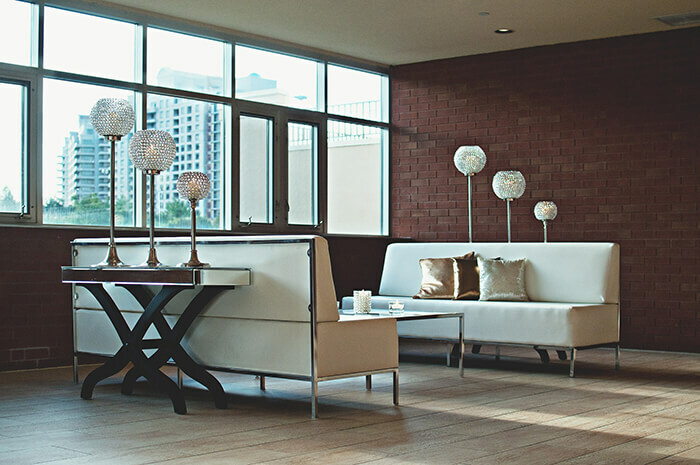 Think about the ambience and overall appearance you want to create, but also consider longevity too. When it comes to windows, the shape of the window has become a really important factor for homeowners. The traditional square and rectangle shapes continue to be the most popular this year, however, this trend leads toward a less obvious, less chunky frame. 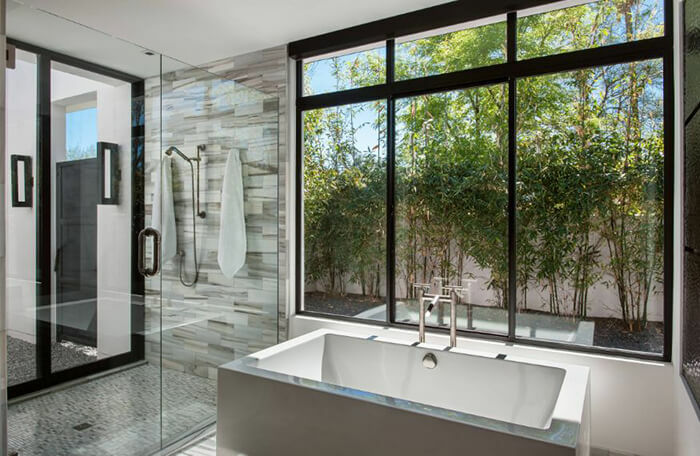 This spring sees a rise in the design trend for more glass, less frame, giving a modern nod to clean lines and a neat, sleek finish. ‘The more window, the better’ seems to be a continuing trend for 2019. 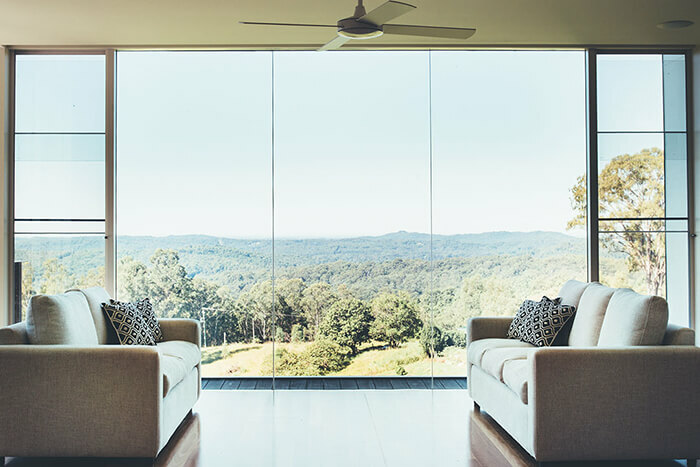 Homeowners are choosing to bring the outside indoors and improve their view by requesting windows that feature glass from floor to ceiling, wall to wall. With this trend in mind, window and door retailers are seeing an increase in the interest for internal bi-fold doors such as these examples from Vufold, due to the amount of light they let in. 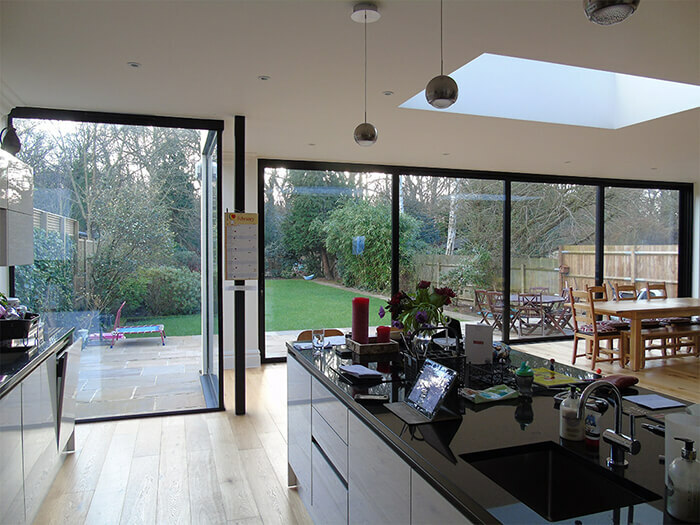 Having a wide set of bifold doors not only brings in plenty of natural light (which of course makes a room more aesthetically pleasing on the inside), but it also makes your home look slick and modern on the outside, too. You can choose from a range of designs and styles to perfectly match the rest of your home, whether you want them to blend into the building materials or stand out for a greater impact. The grid design – which is more common on windows than doors – seem to be well on its way out for 2019. The grid design used to be popular to create that cosy cottage style, with its whimsical, homely appearance. If you really love the look of grids (perhaps you have a little cottage in the countryside, in which this look could still be pulled off) consider making the design more minimal so that your view isn’t obstructed. Across both windows and doors, one of the more surprising trends to come out of the spring/summer 2019 season list is the use of black frames. Year after year, we see white and cream frames, with grey making an appearance last year. However, black is slowly making its way forward, due to its ultra modern and industrial feeling. Designers have played around with black frames for stylish offices and hotels, with it now making its way to houses and apartments. Although it sounds a little daring, it actually seamlessly transitions into more the more classic homes – like new builds – really well. Here’s one we’ll all be familiar with: have you ever left your home and couldn’t remember if you locked the door? What about that time you couldn’t reach for your keys to unlock the door, because you were just too loaded up? 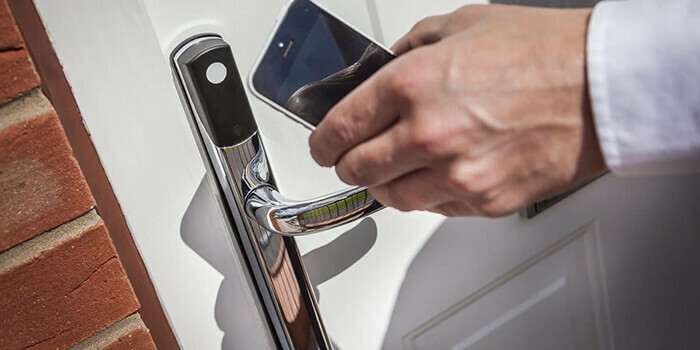 Welcome to the newest technology launch of smart door locks – a technology that we’re going to start seeing more of in the near future. It works with your phone through a Bluetooth system, pairing with downloadable smartphone applications. It’s been designed to help you out if you find yourself in those situations where you can’t get to your keys. For an even modern advanced technology, you can also install a ring video doorbell too. This will let you see a live video of your door and sends you instant mobile alerts when someone presses your doorbell. You can even speak to them, through your phone, if you’re not home. Ideal for if you need to speak with the postman when you’re about to miss your package! Are you ready to begin choosing windows and doors as part of your home improvement project this summer? Remember to have a good shop around, and if needed, don’t be afraid to call in design professionals for extra help, who are qualified to assist you in sorting through all the latest trends. They can assess exactly what your home needs, all without overstepping your budget goal.